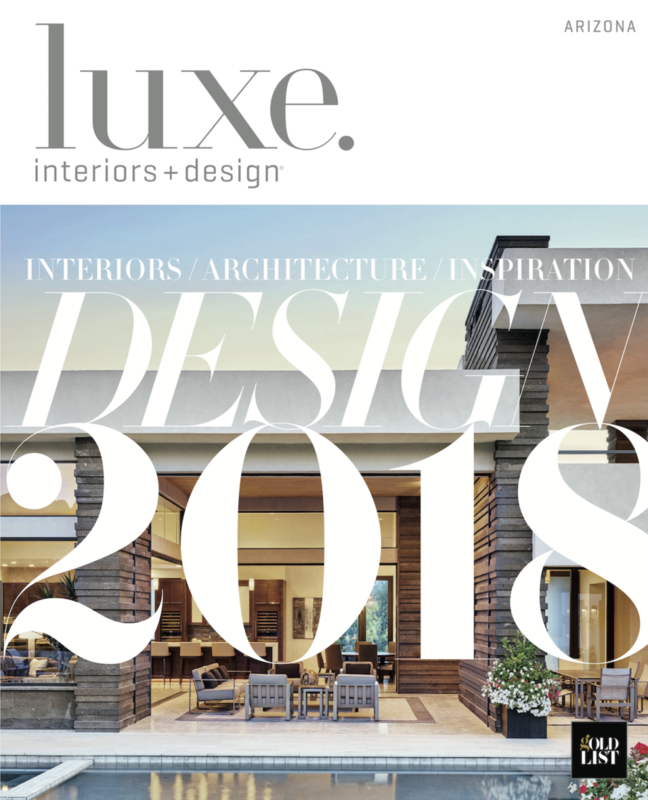 DW designed Outside In was featured in the January/February 2018 issue of Luxe Interiors + Design. We’re honored to have also been featured on the cover of the issue. 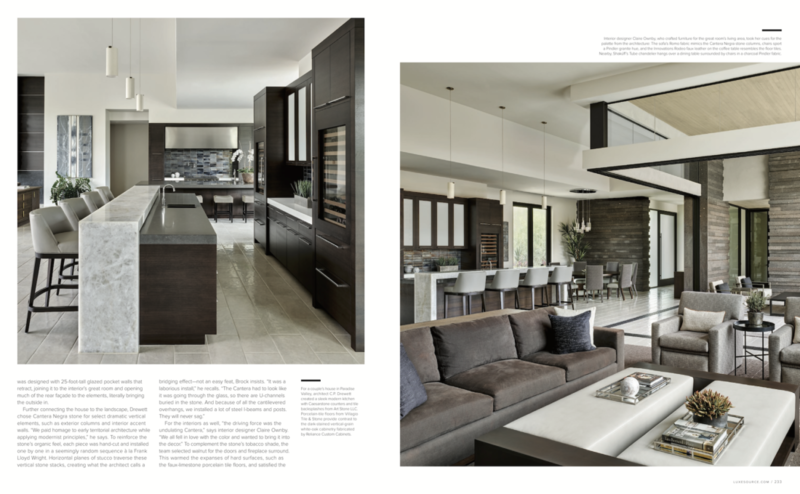 Thank you to Jorge Arango for the wonderful article and also to Werner Segarra who took some fantastic photos of this beautiful, award-winning home. Optimized for Entertaining, a Paradise Valley house connects with its desert surrounds. It was just the two of them now, an empty-nester couple ready for a new address in Paradise Valley. But the modern home they envisioned building on the unassuming lot with fantastic mountain views would be a place they anticipated many besides themselves would enjoy. “These clients are deeply hospitable people,” says C.P. Drewett, the architect hired to construct the couple’s residence. “The manner in which a group of friends would enjoy the space was nearly as important to them as how they would live there individually.” This meant the structure would be designed in a way that made it as comfortable for two as for a houseful of guests, and a key to this was enabling seamless movement between indoor and outdoor entertaining spaces. The shape of the parcel, a flag lot—much like a rectangular flag on a pole—is an unusual configuration but one builder Rich Brock considers an advantage. 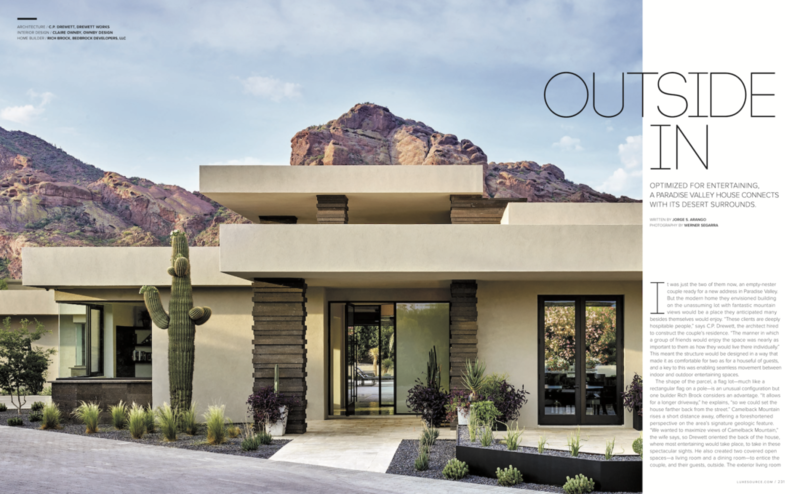 “It allows for a longer driveway,” he explains, “so we could set the house farther back from the street.” Camelback Mountain rises a short distance away, offering a foreshortened perspective on the area’s signature geologic feature. 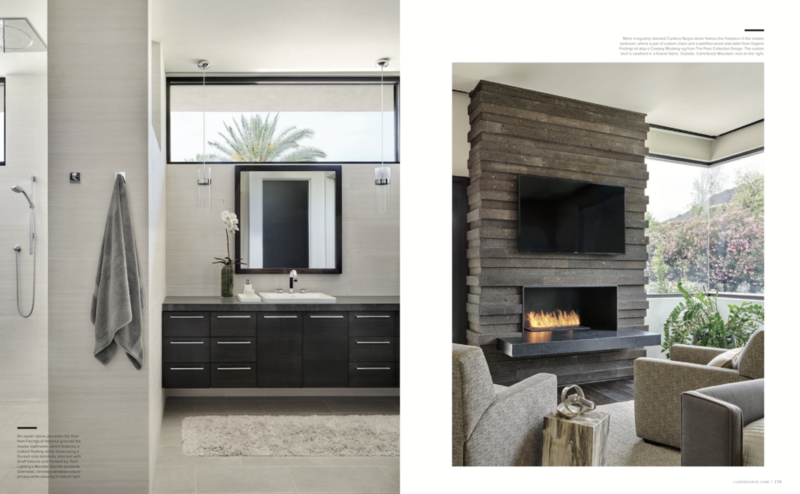 “We wanted to maximize views of Camelback Mountain,” the wife says, so Drewett oriented the back of the house, where most entertaining would take place, to take in these spectacular sights. He also created two covered open spaces—a living room and a dining room—to entice the couple, and their guests, outside. The exterior living room was designed with 25-foot-wide glazed pocket walls that retract, joining it to the interior’s great room and opening much of the rear façade to the elements, literally bringing the outside in. The interior designer also paid detailed attention to the kitchen layout, an important entertaining space. “It’s open to everything,” she notes. “We placed the sink so it’s out of view of the dining room. 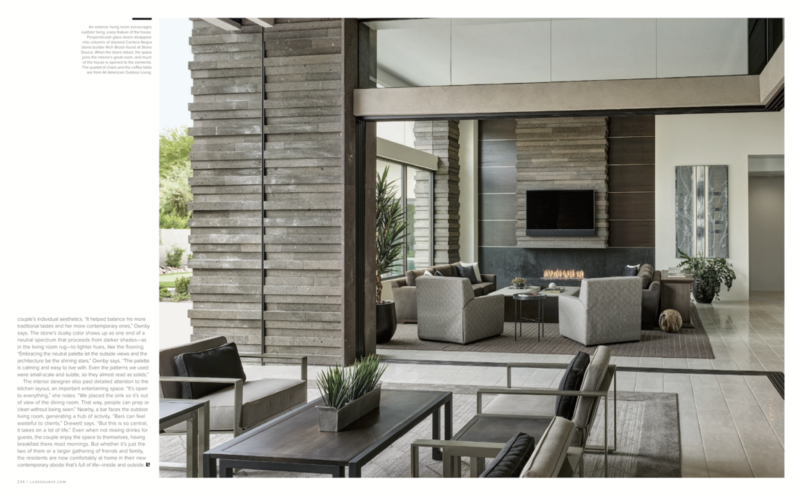 That way, people can prep or clean without being seen.” Nearby, a bar faces the outdoor living room, generating a hub of activity. “Bars can feel wasteful to clients,” Drewett says. “But this is so central, it takes on a lot of life.” Even when not mixing drinks for guests, the couple enjoy the space to themselves, having breakfast there most mornings. But whether it’s just the two of them or a larger gathering of friends and family, the residents are now comfortably at home in their new contemporary abode that’s full of life—inside and outside.